5. Follow The Fleet (1936) is based on Hubert Osborne's play Shore Leave (1922), which was turned into a stage and film musical composed by Vincent Youmans (who later wrote the music for Flying Down To Rio (1933)). The sailors-on-shore-leave plot has been used many times since, including in the Comden-Green-Robbins-Bernstein musical On The Town (stage version 1944, film version 1949). But what did we see? We saw the sea. Seeing the Black Sea isn't what it's cracked up to be. At the ten-cents-a-dance Paradise Club they separately encounter Bake's old dance partner Sherry Martin (Ginger) and her bespectacled schoolteacher sister Connie (the singer Harriet Hilliard, later of "Ozzie and Harriet" fame). Sherry performs at the club, and we see her sing a great version of "Let Yourself Go" with a backup trio that includes Betty Grable. While Sherry and Bake are getting reacquainted, Connie is getting a makeover from Lucille Ball (in a bit part) and other dancers at the club. When she emerges without her glasses and dressed in one of Sherry's silver-lame gowns, the aptly named Bilge (a love-'em-and-leave-'em type who'd earlier spurned her) suddenly takes notice. Unfortunately, the combination of Scott's callous character and his leaden screen presence make it hard for me to care whether he gets the girl—in fact, Bilge would clearly be bad news for the smart and sincere Connie. One of the remarkable things about Roberta, one of the models for Follow The Fleet, is that Fred & Ginger's romance is almost an afterthought to the story of Irene Dunne and Randolph Scott. This offhand treatment of the Fred-Ginger romance was corrected in Follow The Fleet, where Bake and Sherry have a number of obstacles to overcome. Bake gets Sherry fired from the Paradise Club and then inadvertently sabotages her audition for a new producer by pouring bicarbonate of soda into her glass of water, thinking he's undoing her rival. Sherry—having performed a terrific tap solo (her only solo dance in the series)—then finds herself hiccuping through a reprise of "Let Yourself Go." In retaliation, Sherry provokes a fight that gets Bake confined to his ship. In her Fred Astaire & Ginger Rogers Book Arlene Croce compares Follow The Fleet unfavorably to Roberta; she calls the earlier film "ineffable" and this one "a bore" (p. 96). In my estimation, Roberta has the fatal flaws of forcing us to imagine Randolph Scott as the head of a Parisian fashion house, and forcing us to watch Scott and Dunne (rather than Fred and Ginger) work through all of the romantic complications. 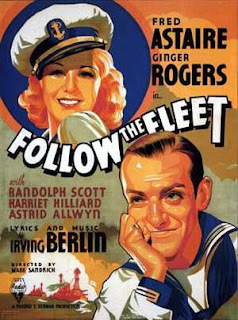 Follow the Fleet makes Scott a sailor (a better fit for his he-man persona) and provides a plot for Fred and Ginger, two vast improvements over the earlier film. I find Follow The Fleet, aided by its great Irving Berlin score, to be one of the most exuberant and satisfying of the Astaire-Rogers musicals. 6. 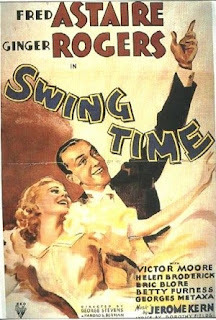 Swing Time (1936) has a reputation in some quarters as the neglected masterpiece of the Astaire-Rogers films. Arlene Croce writes "There never was...a greater dance musical" (p. 103). Hmmm. This is another movie where my opinion diverges from Croce's. For me, Swing Time is something of a letdown after the delights of Top Hat and Follow The Fleet, mainly because the plot is so contrived. Fred is the professional dancer and gambler "Lucky" Garnett, whose pals (including Victor Moore's slow-talking sleight-of-hand specialist "Pop") conspire to keep him from his wedding to Betty Furness' Margaret. They convince him that he has to have his formal pants cuffed; pantsless, Lucky misses the wedding. When he finally gets there he does make a deal with Margaret's father, though—if he can earn $25,000 at gambling, the wedding is still on. (What concerned father would refuse that offer?) Penniless Lucky, still dressed in his wedding outfit of top hat and tails, then hops a freight train to the big city to make his fortune and win the girl, and Pop scrambles on after him. Lucky and Penny decide to form a dance partnership. Much business then ensues involving rival nightclubs and the winning and losing of the contract of Ricardo Romero (Georges Metaxa) and his band, who are apparently the only dance band in New York. To complicate matters, Romero is in love with Penny—like Eric Rhodes' Alfredo Bedini in Top Hat, he's an utterly non-credible rival to Fred. At least this plot line does provide an excuse for Lucky and Penny's audition number, "Waltz in Swing Time." Swing Time is generally praised for how well the songs are integrated with the script, but beautiful as this dance is, it's basically an item number. 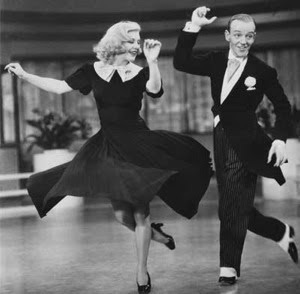 Unlike "Smoke Gets In Your Eyes" or "Cheek to Cheek" or "Let's Face The Music and Dance," "Waltz in Swing Time" doesn't tell a story about the characters (though when the dance is so enjoyable, who's complaining?). There's actually another item number in Swing Time: "Bojangles of Harlem," a solo with chorus that Astaire dances in blackface. Croce calls this "the homage...of one great artist to another" (p. 107), and it is surely intended as Astaire's tribute to the great tap dancer Bill "Bojangles" Robinson. And as a dance, it's astonishing—Astaire wears taps on his palms as well as his shoes, and sets up complex counter-rhythms between the music, his feet and his hands. And in the middle section of the number Astaire dances in and out of synchronization with three "shadows" (created by trick photography, not by dancers behind the scrim). But it's hard to get past the blackface thing. While I realize that blackface is a complex cultural phenomenon—even black performers donned blackface—its association with racist stereotypes overwhelms its more nuanced meanings. I have to confess that this sequence, brilliant as it is, is hard for me to watch. Back to our story, where Lucky vacillates between trying not to earn the $25,000 so he can stay in New York and woo Penny, and acting cool to Penny every time Pop reminds him of his engagement. This push-me pull-you relationship is comically encapsulated in "A Fine Romance," where first Lucky, then Penny (after she learns of his engagement) take turns rebuffing the other (and singing the verse). Penny decides that she's going to marry Romero after all, giving Fred and Ginger the opportunity to dance a beautifully poignant farewell duet together to Kern's "Never Gonna Dance"/"The Way You Look Tonight." The denouement, though, has to be one of the least convincing in the series. Romero falls for the same, lame "your trousers should have cuffs" gag that prevented Lucky's wedding to Margaret at the beginning of the film. And then Penny, learning of Lucky's now permanently broken engagement, decides amid gales of forced laughter that "There isn't going to be any wedding"—to Romero, at least. To me this scene reeks of the writers' desperation to wrap up the movie, and confirms the truism that watching other people laugh is rarely funny. Fred and Ginger do get a coda, though, where they sing "A Fine Romance" and "The Way You Look Tonight" simultaneously in harmony, as snow falls on New York. A lovely ending to a film that for me—whenever Fred and Ginger aren't dancing, at least—doesn't quite live up to its reputation.